I've been feeling a bit like a wrung-out dishrag lately, creatively speaking, I mean. A reader very kindly pointed out the other day that you all would be a lot happier if I posted more often, to which I could only bleat "I'm so sorry, I know!" at the screen and sink my head in defeat. I mean, I'm the first to feel bereft when my favorite blogs go silent for more than a few days. I guess I poured so much energy and heart into finishing the book that now that it's over, instead of feeling full of inspiration and moxie, I'm feeling a little empty when it comes to cooking and writing about it. For a few weeks after I finished work on the manuscript (and the final testing of the recipes), I could not turn on the stove to save my life. I just couldn't. I couldn't stand the sight of the measuring cups, the mixing bowls, the sink waiting to be filled with dirty dishes. I had to stop seeing it as the final frontier, the final battle zone between me and the finished manuscript before I could enter it again with hunger and a lust for cooking. Add that to the fact that I am now single-digit weeks (eeep!) away from giving birth and you'll understand why sometimes I sit here in front of the computer trying to think of things to tell you, but coming up empty. I mean, I can spend hours thinking about organic baby mattresses, what on earth - WHAT - we should name our baby and, uh, trying to wrap my head around labor, but then dinnertime rolls around and I'm eating a handful of sliced cucumber and a peanut butter sandwich. You know? Remember Elaine Louie's wonderful The Temporary Vegetarian column in the New York Times? The source of such delicious things as Heather Carlucci-Rodriguez's Chana Punjabi, Aytekin Yar's Zucchini Pancakes and Julie Sahni's Green Beans Bihari? I loved that column so much. (It no longer exists, but you can buy the book it was turned into right here.) Slowly but surely, I'm hoping to cook my way through most of the recipes she published (Cabbage Strudel, anyone? I'm still kicking myself for having lived mere minutes away from the strudel shop on Queens Boulevard for almost three years and never having made it there.). The recipe with which Louie retired the column was from Diane Kochilas, Greek food writer and consulting chef at Pylos: a Greek riff on the classic Italian risotto, using ouzo instead of white wine and feta cheese instead of Parmesan and butter. I made it for dinner last night and the one thing I kept thinking as I ate it was, forgive my ineloquence, woah. I left out the garlic that was in the original recipe, because I think garlic in risotto should be against the law, and I used Pernod instead of ouzo because that's what I had in the house and if I made this again, I would use water instead of broth, probably, and also a bit less feta, because I actually don't really like to feel like I'm fighting my way through dinner, even if it does taste very good. But eating it in the soft dusk light that came in from the balcony and being reminded of our trip to Greece last September was lovely, really, and just the kind of thing that makes me want to cook again and again and again. Note: To grate a tomato, halve crosswise and grate the cut side with a coarse grater over a lipped cutting board or bowl. Grate as close to the skin as possible, then discard the skin. 1. In a large, deep skillet over medium-low heat, heat olive oil until shimmering. Add onion and stir until soft, about 6 minutes. Place broth in a small saucepan and bring to a simmer. 2. Raise heat to medium, and add rice to skillet. Stir until well-coated with olive oil and starting to soften slightly, 2-3 minutes. Add 1 cup of the simmering broth. Keep stirring gently until the rice absorbs all the broth. Add Pernod and stir until absorbed. 3. Add grated tomato and stir gently until the mixture is dense. Add remaining broth, 1 cup at a time, stirring until each addition is absorbed, until the rice is creamy but al dente, 25 to 30 minutes. 4. Add feta and stir until melted and risotto is creamy and thick. Stir in oregano and lemon zest, and season to taste, if needed, with salt and pepper. Remove from heat and serve immediately. I did not mean to leave you hanging that long. In fact, I had this post stashed right up my sleeve, but then in a serious case of First World Problemitis, the other camera, the camera with which I took these photos, well, it lives with Max in Kassel, not with me in Berlin, and because he is a PC person and I am a Mac person I could not for the life of me figure out the instructions that he kept emailing me about unzipping the files of the photos he sent me and so I kept bleating, per email, back at him to just send me the photos as regular files already and he kept writing back to me asking me to download yet another program from the Internet to unzip the aforementioned files and I definitely didn't want to write a post without photos because who cares about unillustrated blog posts anyway and for Pete's sake I have standards and then he forgot his camera in Kassel when he came home this weekend and oh my goodness, are you still reading this? Seriously? Because I'm falling asleep over here and I'm the one who's typing! All of this is to say I'm sorry it took me so long to write again. But look! I brought you spaghetti! With fresh tomatoes and basil and squidgy-soft mozzarella! I hope that makes up for something at least. This is the kind of thing you want to make when you don't really feel like cooking anything at all, which, I find, is the way I feel all the way through July and sometimes August, too. Maybe it's too hot to cook or it's too hot to eat or maybe you simply have better things to do with your time than stand around in the kitchen, like canoeing down soft little rivers or picking sour cherries or drinking beer in outdoor cafés until the sun goes down or writing a freaking book, but since you can hardly subsist on popsicles or beer nuts alone (actually, you can, but perhaps your family cannot), if you can bring yourself to boil a pot of water for pasta you've basically done most of the work. The rest involves dicing up a bunch of very good tomatoes, that very being italicized for a reason as your tomatoes should practically glow with flavor and burst with juice, slicing garlic (the original recipe has you dice the garlic finely, but I don't like raw garlic and never will, so I slice it, leaving it big enough for your fork to avoid, but by all means, do as you wish, because I do not choose to impose my tyranny against raw garlic against anyone, well, except for one particular individual whose mouth I like to get close to at times), and snip a whole mess of basil into a bowlful of olive oil. This you can do first thing in the morning before you go to work, leaving it to macerate all day while you go and do whatever it is that you all do. (What is it you all do, anyway? Really. Doctors, secretaries, grant writers, students, anthropologists, mothers, who are you? Tell me below in the comments!) When you come home in the evening, all you have to do is boil your pasta and dinner is served. If you are, like me, a little more of the last-minute type, rest easy knowing that even if you don't manage to do this chopping, macerating business until two hours before dinner, you're still in pretty good shape. The original recipe has you marinate the basil and garlic in olive oil all day long, adding the tomatoes only a few hours before dinnertime. But instead I mixed together everything at once, two hours before dinner, and went out to take a walk in these improbably beautiful fields on the very edge of Kassel. One minute you're still in the rather unlovely town of Kassel, the next you're staring at a mass of poppies in a field of wheat stalks and there is a lone horse in one corner and an allee of oak trees in another and you suddenly have the very distinct impression you are on the set of an avant-garde French film. Once you've boiled the spaghetti and drained it and plopped it on top of your cubed, fragrant tomatoes, you chop up a ball of mozzarella (plain old cow's milk is fine) and put that on top of the hot spaghetti. The original recipe says that if you leave it to sit for a bit, the mozzarella will melt and fat will coat each strand of spaghetti. To be honest, we didn't have that kind of patience. I let the mozzarella start to melt, but we were so hungry at that point that we just dove right in, before any milk fat could coat a single strand. Now, before there are any, uh, misunderstandings, let me be quite clear: this pasta dish would be a definite no-go in Italy. Italians are, well, let's say earnest about their spaghetti sauces and they have rules about food and they do not take kindly to mucked-up sauces or pasta salads or other abominations (their imagined words, not mine! ), in fact, they can be are positively Germanic in their obsessiveness with following food rules. Now that we've gotten that disclaimer out of the way, let me just say that this is a delightful plate of spaghetti and that it had both of us tipping our pasta plates into our mouths so we could get every last drop of milky, basil-flavored, tomato-juice-tinged, garlic-imbued olive oil sauce down our greedy gullets. It was delicious. And refreshing, if you can believe it, and light and sort of exactly the kind of thing you'd want to eat on a nice summer's evening. 1. Take out your largest bowl. Add the garlic. Pour in the olive oil. Snip the basil leaves with scissors into shreds over the garlic mixture or slice thinly with a very sharp knife. Let sit all day or at least an hour or two. 2. About 2 hours before serving, chop the tomatoes and add them to the bowl. 3. When you’re ready to eat, bring a large pot of generously salted water to a boil. Add the pasta and cook until al dente. Meanwhile, cut the mozzarella into small cubes. 4. Drain the pasta and pour it on top of the tomato mixture. Do not stir. Spread the mozzarella on top of the pasta and toss only the pasta and cheese; the cheese will soften slightly, and the pasta will get coated with fat. Then stir up from the bottom, incorporating the tomato mixture. Season to taste and serve. When this happens to you, do you usually throw in the towel and go out for lunch? Or do you scrounge around until you find something suitable to eat, even if that means canned sardines on top of instant polenta with toasted sesame oil for flair? If I had not still been wearing my pyjamas at lunchtime (uh, one of the benefits of working from home, yes), I would have thrown in that towel and made someone else make me lunch. But vanity and laziness made me resourceful. You see, we did have a small jar of anchovies in oil and a can of my very favorite pomodorini di collina and an obliging parsley plant on the balcony. I first read about this sauce on Rachel's mouthwatering blog earlier this year. It's Marcella Hazan's recipe and seems to be almost like the devastating Sofia Loren to her more Jayne Mansfield-like tomato-butter-onion cult. You melt a few anchovies in some olive oil, throw in a bit of garlic (I leave mine in chunks big enough to fish out, but you could mince it, too), and then simmer a can of tomatoes in that dark, funky base until the sauce is reduced and thick enough to coat a panful of spaghetti. I find it needs a bit of chopped parsley to make it feel like a proper lunch, but that's about it. You barely need any salt, you certainly don't need any grated cheese on top and the sauce's richness (not fishiness, don't worry) makes for a very satisfying meal. With a square or two of chocolate for dessert, of course. One needs something special to book-end a scrounge-y meal like this, after all. So, tell me, readers: what do you eat when there's "nothing" at home to eat? 1. Heat the oil in a skillet and gently brown the garlic over low heat. Add the anchovies and, stirring constantly, allow the anchovies to melt into the oil. 2. Add the tomatoes and bring the sauce to a low simmer. Let simmer, uncovered, for 20 to 25 minutes. Taste for seasoning. In the meantime, bring a pot of water to the boil and cook enough spaghetti for two or three people. Drain the spaghetti, toss with the sauce and sprinkle with parsley. Serve immediately. I am sitting here in my office right now, the sky as dull as a washed-out t-shirt outside the window, rain leaking from above, feeling very far away indeed from the sultry colors in the photo above. In fact, it almost feels sort of cruel to post it; it's like a taunt from the last beautiful days of summer, strutting around all triumphant in fancy heels and a perfect summer dress, while you - autumn - have given up and retreated to the bedroom in saggy sweatpants and itchy woolen socks. Let's kick summer in the teeth, shall we? Now is the time of apple picking and pretty scarves, Sunday afternoons at the movies and hard work, after all. Nothing to be ashamed of! Also, summer, this sauce doesn't belong to you. Okay, so remember my friend Alessandro? His mother, Gabriella, is quite possibly the very best cook I know, and I happen to be blessed with a lot of good cooks in my life. She is from Bologna, the culinary heart of Italy, and she creates magic at her stove, from delicate breadcrumb soups to lusty pigeon sauces and briny octopus-potato salads. She's the woman who taught me how to make real ragù Bolognese and a mean lasagna. Also, ragù di pesce. Fish sauce, if you're wondering. Though "fish sauce" sounds rather...fishy, and wan. Like something beige and sticky you'd see napped on boiled potatoes so old they've grown skin at a German university canteen. And the fish sauce, er, ragù di pesce (pronounced rah-GOO dee PESH-eh) I'm talking about is a spicy, briny, fantastical thing that you toss with spaghetti, grabbing your heart at first bite. It is my not-so-secret hope that one day, I will be able to spend enough time in Gabriella's kitchen that she'll cook her way through her entire canon with me. In August, we started modestly: with grilled, stuffed tomatoes (I'm saving the recipe, my darlings, for the book) and this ragù. (Well, there were also a tray of gratinéed mussels and grilled fresh anchovies, tossed in herbed breadcrumbs, but those were more incidental lessons than anything else. Still, are you hungry yet? I just had breakfast and my stomach is growling.) And because sharing is giving, it is too good to keep to myself. May your September be rich in ragù di pesce! You begin, appropriately, with the fish. At the fish market in the next town over from the village where my mother and our friends live, near the Adriatic coast of Italy, you can buy a little mixture specially made by the fishmongers for ragù. It's got bits of salmon and monkfish, tiny shucked clams, chopped squid, and some shrimp cut into it. You can make your own fish mix in places without such a lovely service by simply buying a couple of different fillets of fish, a few shrimp and octopus, and a handful of clams, and then chopping and shucking everything up at home. You'll want about a pound in total. To make things a little special, you can also buy some fancy scampi to serve on top of the plate of spaghetti. But that's just if you have guests that you really want to impress. If it's just a regular old Tuesday night, skip this step. Gabriella also bought cannochie, a specialty of that part of the Adriatic. I'd never seen them anywhere else before, but the Internet says they're called mantis shrimp in English. Have you ever heard of them? Anyway, they look sort of goofy and they're spiny to no end, but once you get past their shell, the flesh is sweet and fresh and almost lobster-like in consistency. Except, there's a lot less of it. Are you the kinds of people to do a proper mise en place before you start cooking? I always wish I would be, but I never am. New Year's resolutions and so on, let's make pretend we're doing a mise. Assemble an onion, some garlic cloves, a big pile of minced fresh parsley, two or three plum tomatoes, a bottle of white wine, a box of spaghetti, some hot red pepper, salt, and...the fish? I think that's it. Now, feeling all virtuous with your organization skills, put on an apron and finely dice the onion and a garlic clove or two. In a wide, deep pan, sauté them togther gently in olive oil, along with several spoonfuls of the minced parsley. You want this mixture to get wonderfully fragrant, but without burning. So monitor the heat and keep moving everything around the pan. When it's done, about 7 minutes later, add the chopped fish mixture and stir well to distribute the oil and onion and garlic and herbs. Let that cook for a few minutes, stirring almost constantly, until you see the very edges of the shrimp start to go gray. Add the scampi and mantis shrimp, if using, and then add about a cup of dry white wine. Mix well and let it cook down for several minutes. In the meantime, seed and chop two plum tomatoes. Actually, three. Pour yourself a glass of that white wine. Let the sauce come to a low boil and busy yourself with other things for a little while, like filling a pot with water for the spaghetti (the sauce as depicted here makes enough for a 454-gram box, which should be plenty for four to five people) and bringing it to a boil. Set the table, if you don't have small children to do it for you, or if your spouse is busy making the rest of dinner on the grill in the garden, teaching that girl with the camera his most precious secrets. When the sauce is, well, saucy, meaning, when the sloshiest part of the liquid has reduced, and the sauce feels thickish, about 10 minutes later, turn off the heat, stir in the rest of the parsley, taste for seasoning and then deal with boiling the spaghetti. As a visual aide, the sauce should look about it how it does in the first photo of this post. When the spaghetti is nice and al dente, drain it and add it to the pan with the ragù, tossing to distribute the little bits of fish and sauce evenly. You want to work quickly so that the spaghetti doesn't turn gummy. It'll absorb a bit of the sauce's liquid in the hot pan, which makes for forkfuls that truly taste of the sea. Command everyone to the table. In fact, if you got them well-trained, they'll know to be waiting, fork in hand, napkin in lap, raptly for you to dish steaming hot plates of spaghetti up in front of them. The fish bits fall apart in the sauce, infusing the tomato sauce with briny flavor. The wine gives depth to the sauce, which is, as these things go, quite a contender for fancy fast food. The parsley adds freshness and a bit of color. But really, calling out the individual elements of the dish is sort of beside the point, because what makes this so delicious and special is how it all comes together on the plate. And even though it's possible to make this ragù at any point during the year now, I think it tastes best when eaten with eyes closed, dreaming of the summer, remembering skin hot from the beach, hearing crickets chirping at night. Dear, sweet, gentle reader. It is taking all of my mental and most of my physical capacity to endure life until tomorrow night when Germany plays Spain in the semi-finals of the World Cup. If you've been following along, and I sure hope you have (the drama! the intrigue! the exhilaration! 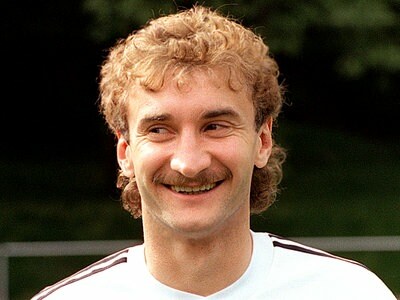 ), you might have caught drift of the way the German team is playing and though I've been a devoted fan since the age of five, when a sticker of Rudi Völler in all his permed and mustachioed glory found a permanent home glued to the underside of a shelf positioned right above my bed so that I could see him before I went to sleep at night and first thing when I woke up, I have to say it's never been this much fun to watch them play. And how they have played! Anyway, since you come here for food and chat and not sports commentary, I will do my very best to keep my nerves to myself, but I'll just say it's hard, okay? It's hard! You should see my cuticles. My new gray hair. Me muttering to myself before I go to sleep at night. "They'll be okay without Müller, right?" "Maybe David Villa will get the stomach flu." "Four goals against Australia! Four goals against England! Four goals against Argentina!" "Please, psychic octopus, please be wrong just this one time." Food and chat, woman! Focus. Okay. So, the other day I was thinking about spaghetti. I think about spaghetti a lot, you know. Maybe because I'm half-Italian. Maybe because we eat it multiple times a week. Maybe just because it's good. Who knows. I was thinking about spaghetti and how I go through phases with spaghetti sauce. Like, there were a good two years where my favorite tomato sauce involved canned cherry tomatoes, a small can of tuna and a garlic clove. I made it over and over and over again until I could no longer look at tuna the same way again (good thing, too). Then I had a thing with Marcella Hazan's tomato-butter-and-onion sauce. Over and over and over again, until it started tasting like tomato soup to me and I had to take a break. Then there was the sauce made with sliced zucchini simmered in diced tomatoes (Muir Glen, I miss you! ), particularly delicious with grated Parmigiano - I do believe that one lasted the longest. But my first love, the tomato sauce that started the obsessive sauce-making, well, I had managed to banish it from my memory so entirely that when it popped back into my head the other day, I almost jumped. That tomato sauce, made of little cherry tomatoes halved and baked in the oven with a cheese-breadcrumb topping, was one of the four pillars of my diet during my first years in New York. I made it All. The. Time. I found it in the Best American Recipes cookbook from the year 2000 and I committed it to memory. My roommates were obsessed, my faraway boyfriend smitten. It was fast, it was cheap, it didn't dirty many pots, and it was delicious. Best recipe, indeed. But as these things go, I overdid it. I made it one too many times, relied on it too much for weekly nourishment. I started getting tired of halving those little tomatoes, making sure their perky little faces faced the right side up in the baking pan, getting the sprinkle of breadcrumbs and cheese just right. One day, I moved on. (What came next? Olives and capers with peeled plum tomatoes, I believe. Oh...that was a good run. Don't forget the parsley.) So on that I forgot all about my beloved baked tomato sauce, until I was lying around thinking about spaghetti sauce the other day, probably in an attempt to distract myself from the terrifying prospect that was the Argentina game, because why on earth else would I have needed distraction? I went through my old recipe binder and sure enough, there was the recipe, lying sweetly in wait to be welcomed back into the fold again. And really, it is so good. The tomatoes, roasting under their garlicky-cheesy cap, collapse and go all sweet and sticky. The breadcrumbs get toasty, the cheese melts and browns, the garlic infuses everything with this savory, mouthwatering scent. You mash everything together loosely, adding some olive oil for moisture and aroma, and torn basil leaves for flavor. Then in go the cooked pasta (penne are nicest, I find, but spaghetti works wonderfully, too). You can dish it up into plates, then, or, if you're eating alone just fork it up out of the serving dish (the little crusty bits in the corners are especially good). And that's it. Obsession-worthy, no? Almost enough to distract me from the game taking place just a short 27 hours and 8 minutes from now. Almost. So now if you'll excuse me, I have some incantations to do. 1. Preheat the oven to 400 degrees Fahrenheit. Grease a 13-by-9-inch baking dish with one-third of the oil. Place the tomatoes cut side up in the dish. 2. In a small bowl, combine the bread crumbs, cheeses, and garlic and toss with a fork to mix well. Sprinkle the bread-crumb mixture over the tomatoes, making sure that each cut side is well covered with the crumb mixture. Sprinkle with salt and pepper. Bake until the tomatoes are cooked through and starting to brown on top, about 20 minutes. 3. Meanwhile, bring a large pot of salted water to a boil. Add the pasta and cook for 8 to 10 minutes, or until al dente. Time the pasta so it finishes cooking about the time the tomatoes are ready to come out of the oven. 4. When the tomatoes are done, add the basil and stir vigorously to mix everything into a sauce. Drain the pasta and immediately transfer it to the baking dish. Add the remaining olive oil and mix well. Serve at once. In the last week, I totaled my car*, almost gave myself a concussion by walking against a rather substantial tree branch and went all Lady Macbeth in my white silk nightgown this morning after slicing open my foot on a piece of glass in my kitchen (apparently, I must learn the hard way that you should never attempt to wipe down your counters before having your caffeinated morning beverage). Who knew a quarter-inch nick on a foot could bleed so much? I kind of wish I'd had the presence of mind to photograph the blood spatters on our white tile floor just now. They looked rather artful. Let's not even talk about how I managed to bust my iPhone on Monday or about the fact that I thought I'd lost all my identifying documents earlier this week. Not even kidding. Is Mercury in retrograde or something? Am I supposed to be thinking of something I'm not? Or am I just on the rather klutzier side of humanity? What I think is really going on is that the universe was balancing itself out in anticipation of my dinner last night. All this mayhem and in the midst of it, I had a stroke of very good fortune: discovering an eggplant sauce for my spaghetti that I loved so much I wanted to eat it with a spoon, out of the pan, with nary a taste for anyone else, spaghetti be damned. This is not to say that losing the car was worth the sauce, but it made the pain easier to bear. It really is something. The sauce comes from the esteemed Mister Lam, rice whisperer and food writer extraordinaire (seriously, click over to his original recipe and feast on his words, would you?). Last year, when Gourmet folded and I, in a momentary sizzle of panic, printed out all the web-exclusive recipes from Gourmet.com, this recipe made it to the top of the stack, only to languish there as I packed up my life in New York and moved to Berlin. And truth be told, it would have languished there further if a certain visitor, sitting at my table last night and hungry for dinner, hadn't told me that it was one of her very favorite things to eat. It is, in the grand tradition of humble Italian peasant food, a very ugly sauce. Gray, slippery and rather limp. You cook cubed eggplant and some garlic in olive oil, with the addition of some stock or water, until it goes all melty and soft and the fibers just sort of collapse underneath gentle pressure. It takes just 20 minutes, long enough to get started on setting the table, eating all the olives in your fridge or just having a drink to unwind from all the stress of your week, whether it involved car crashes and bleeding feet or not. Then, using a fork or a spoon or whatever you have around, you mash up the eggplant until it's, well, saucy. And to brighten up each spoon-, er, forkful, in goes some sliced basil and good dollop of minced sun-dried tomatoes. And salt. Don't forget the salt. The noodles, chewy and slippery, curl around the pockets of sweet, savory eggplant, the basil snakes between each bite and a pop of tomato here and there makes the water run together in your mouth as you eat. You don't even need a grating of Parmigiano. You've got all you ever needed on your plate, right there. Halfway through the cooking process, I realized that it was this very technique that kept me fed and happy years ago while living in Paris. Only instead of eggplants, I used zucchini - for a pea-green sauce as sweet as the day is long - or cauliflower. Both vegetables do stunningly well with long cooking times and a careful mashing, turning themselves into silky, toothsome sauces that you can brighten up with mint or parsley (for the zucchini) or a good grinding of hot red pepper flakes (for the cauliflower). Both do very well indeed with a judicious grating of Parmigiano on top. In any case, it's a technique for your kitchen as indispensable as boiling eggs or mastering a very good, plain tomato sauce. Armed with just one eggplant, just a few handfuls of cauliflower florets or a zucchini or two, you can stew your way to spaghetti nirvana in the blink of an eye. Did I mention the salt? Don't forget the salt. It's the difference between a sauce that makes you sit up and pay attention and a sauce that just hums quietly along instead of singing loud and clear. One last thing: the recipe below says that a one-pound eggplant will be enough for a pound of spaghetti, but we ate far less spaghetti than that (190 grams for the two of us, actually) and while there was more sauce than any of my Italian family members would have deemed acceptable on our plates, you might want to adjust your sauce-to-noodle ratio as you see fit. *As a result, I missed the Food Blogger Connect conference, which really was the worst luck of all. I'm sorry to have missed any of you intrepid readers who made it there! Oh, and in completely unrelated news, The Wednesday Chef now has a Facebook page! Come on over, let's be friends. 1. Lightly salt the slices of eggplant, stack them back together and let sit for 20 minutes. 2. Put the olive oil in a wide, heavy saucepan, add the garlic cloves, and set over low heat. 3. Dry off the eggplant, cut it into chunks. When you start hearing the garlic sizzle a little and can smell it, drop in your eggplant and stir to coat it all with oil. Turn up the heat a little bit to medium high and add the thyme or oregano and stir. When the eggplant is turning translucent and softening, add the liquid, let it come to a boil, and turn it back down to medium-low. Let it bubble for a bit and cover it, leaving a crack for steam to escape. Stir once in a while so that the bottom doesn’t stick. 4. After about 20 minutes or so, the liquid in the eggplant pan should be mostly evaporated and the eggplant should be soft and melting. Mash it with a fork or spoon, and adjust the seasoning to taste. 5. Toss the eggplant purée with the spaghetti that you cooked al dente. Stir in the minced tomatoes and basil. You can gild the lily with drizzling on some more oil. Serve immediately.